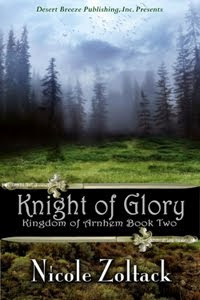 Today, I will be reviewing Nicole Zoltack's Kingdom of Arnhem series: Woman of Honor and Knight of Glory. On my blog, Surrounded by Books, I will be interviewing fantasy romance author Nicole Zoltack. You can read the interview here. Book Blurb: Aislinn of Bairdhe dreams of becoming a lady knight to honor the death of her fallen brother. To her mother's horror, King Patrick grants Aislinn's wish and she begins her long years of training. Review: Nicole Zoltack's Woman of Honor weaves the tale of the first lady knight of Arnhem. 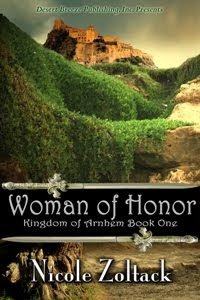 Sprinkled with historical facts, bullies, and a good dose of love and honor, Woman of Honor is a coming of age novel set in the fantastical medieval world of Arnhem Kingdom. Aislinn is brave and truly grows to be a woman of honor. The characters are likeable and realistic. We feel Aislinn's pains while she tries to prove herself. She overcomes tradition and the growing threat of Speica. This novel has history, knights, and mythological creatures and is filled with intrigue, mystery, horror, and, most important of all, love. In this first book of the Kingdom of Arnhem series, I feel like we touch upon their lives and a conflict looming in their future. By the end, I craved more from this fantastical world, and I'm glad Ms. Zoltack supplied it in her next book. Book Blurb: Sir Geoffrey, along with some companions, has been sent away from Arnhem, entrusted by Queen Aislinn for a special mission, and has to leave behind the mysterious lady Celestia. On his journey, he uncovers seeds of a sinister plot, learns a horrible secret, and makes a new friend in exile Jenanna. Rumors abound that the Speicans have enlisted a mage of their own, to work unspeakable, forbidden magic. The war between Speica and Arnhem has just begun. Will Geoffrey survive the battle to live another day and discover which woman he truly loves? Review: Nicole Zoltack's Knight of Glory follows Sir Geoffrey's quest for love and honor. With the growing threat of Speica and a dangerous Villaimage, the Kingdom of Arnhem may have met its match. Whereas in Woman of Honor, we see the historical aspects of knighthood, in Knight of Glory, Ms. Zoltack builds upon her fantastical world. We learn of new kingdoms, including the dwarven kingdom in the south and the troll kingdom in the north. New mythological creatures come into play, and we get our first real doses of magic. Despite battle brewing, love conquers all bounds. Filled with bitter foes, magical displays, a quest for true love in many cases, and a dash of enigma, Knight of Glory is a true delight. By the end, we understand that a brewing war of good and evil is afoot, but unfortunately, we must wait until May 2011 for the third book of the Kingdom of Arnhem series, Champion of Valor. I look forward to this third book and more from Ms. Zoltack. Whoops! It came out twice. I've heard of this series but not read any. You've certainly got me intrigued. Thank you. These sound really good. I may pick them up!